Some books are easy to review, some books are hard. This one falls into the latter category. It was a heart-wrenching read. But it was also chock full of hope and beauty. About a year or so ago, I read Elie Weisel's NIGHT, which is a memoir about his experience enduring and surviving the Holocaust. It was horrifying, but I didn't begrudge Weisel's desire to relate the blunt horrors he experienced. I would never presume to say that it's not important to talk about things as they really are or were, without any "stage makeup" hiding all the ugliness. And perhaps people need to be shocked out of their comfort zones in order to comprehend things that have actually happened. 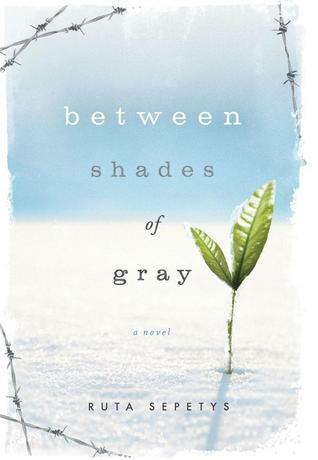 I'm not sure, though after reading BETWEEN SHADES OF GRAY, I think that's probably not the case. But I do know that it hurts my heart to read books like NIGHT. I had a very, very difficult time with that book. When I opened BETWEEN SHADES OF GRAY, which, though it is about the effects of Josef Stalin's Reign of Terror upon the people of the Baltic region, feels quite similar to a Holocaust story, I didn't expect a heartwarming tale. I did hope for one. Generally, with fiction, I feel like I'm a step away from the things I witness in the story. I'm a "safe" distance from conflict. But with non-fiction or memoir, I feel like I'm in the thick of things, and this can be a very uncomfortable feeling. Because BEWEEN SHADES OF GRAY is based on history, I felt like I was somewhere in the middle. I love historical fiction, and I believe that it's so very important to read literary works that are birthed from history. I enjoyed the book much more than I would have enjoyed it had it been autobiographical, because I wasn't so absorbed in the book that it affected my life (yes, I love books that much). I knew that it was an important book--one that told a story that might not ever be told, otherwise. Evil will rule until good men or women choose to act....This testimony was written to create an absolute record, to speak in a world where our voices have been extinguished. These writings may shock or horrify you, but that is not my intention. It is my greatest hope that [these] pages...stir your deepest well of human compassion. I hope they prompt you to do something, to tell someone. Only then can we ensure that this kind of evil is never allowed to repeat itself. Though this quote comes in the form of a letter that is discovered by a character who appears at the end of the book, it is as though the author is speaking to her reader--her YA audience (or the old gals like me who read and love YA). Don't be fooled by where this book is shelved in your library. Though it's fiction, it's truth. I've spent a lot of time in this review on the plot of the book and on the history behind the plot, but let me also say that the writing is wonderful. And the characters are wonderful. At one point, a little girl in the story whose doll has been "murdered" by Soviet soldiers, tells the other characters that her doll speaks to her from heaven and then proceeds to say and do things that would be impossible unless that were actually true. It's that kind of character-writing that brings these wonderful, suffering people (one of whom is actually a "bad guy" throughout most of the novel) into the heart of the reader. People I didn't know formed a circle around me, sheltering me from view. They escorted me safely back to our jurta [hut], undetected. They didn't ask for anything. They were happy to help someone, to succeed at something, even if they weren't to benefit. We'd been trying to touch the sky from the bottom of the ocean. I realized that if we boosted one another, maybe we'd get a little closer. "Lina, think of what your father would say. A wrongdoing doesn't give us the right to do wrong. You know that." Please don't think that these "feel good" passages aren't deserved. There is so much of suffering in this story. Any glimmer of hope or any kind word is so, so heart-felt and so needed. It's really lovely writing, and the characters are just amazing. I recommend this book to mature audiences (YA and up--there is some violence and a lot of death), particularly teachers and homeschooling parents, or anyone else who wishes to guide young people to learn more about the past. Also, I recommend reading this book in combination with Eugene Yelchin's BREAKING STALIN'S NOSE, which is about a young man growing up in Moscow during the Reign of Terror. A final note: Ruta Sepetys was a recent finalist for the William C. Morris award, "for a debut book published by a first-time author writing for teens." She was Cybils(Children's and Young Adult Bloggers Literary Awards) award finalist in 2011 for BETWEEN SHADES OF GRAY, and she also received a General Work-in-Progress Grantfrom the Society of Children's Book Writers and Illustrators in 2007. MATURE THEMES: Everything. This is not subject matter for young children. There is genocide, slave labor under the worst of circumstances, murder, physical and mental abuse, prostitution, etc. But please note that for all that, this is a book about human goodness and hope. Thank you for this review. I am looking forward to reading this. I went to Lithuania, Latvia, and Estonia this past summer. I was in Riga, Latvia for a ceremony on the anniversary of the day they took the people to Siberia. I saw a train car they were transported in. I will never forget the survivors of Siberia walking down the road with flowers to place at the base of the freedom monument. I also met the most wonderful old woman in full dress who lost her family. The sad thing was that 98% of people watching were old. After I was done bawling after the ceremony, I walked right up to the Latvia presdient to shake his hand. I didn't think they would let me and guess what the only thing I could think of to say was? Hello. Oh, WOW, Melissa. Thank you so much for telling us about your experience. How heartbreaking that most of those who survived this deportation are now elderly people. But how wonderful and special that you got to shake the hand of the president of Latvia! And thank you for the book recommendation. What a great review. I had heard of this book but didn't know anything about it. I didn't learn anything about Lenin or Stalin in high school (for shame!) and was very powerfully moved by an amazing play I saw at BYU called Archipelago about the Stalin work camps. I will have to pick this up, for sometime when I am feeling like I can handle the weight of this. I picked up this book because I'd heard good things about it, but I wasn't expecting to like it as much as I did. And it made me aware of events in history I hadn't known much about.